Card Text During their “draw cards” step, your opponent refills their hand to 1 less card. At the end of my opponent’s turn, they have 1 chain and 5 cards in hand. If I have Succubus in play during their “Draw cards” step, do they remove the chain? No. Chains are removed when a player would draw at least one card during their “Draw cards” step and one or more chains prevent them from doing so. 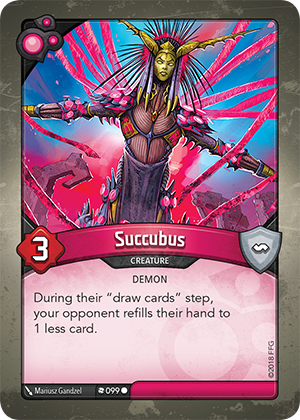 Because of Succubus’ ability, your opponent with 5 cards in hand would not draw any cards during the “Draw cards” step of their turn. Therefore, the chain did not prevent them from drawing any cards and they would not remove the chain.